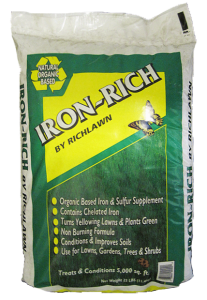 Iron~Rich by Richlawn is a great supplement to any lawn fertilizing program. It will stimulate growth, turn yellowing lawns green, improve your soil structure, and increase the general health of your turf. Use Iron~Rich to supplement feeding of all of your plants, providing the plant with the necessary nutrient – iron – promoting dark, lush, green foliage. Use Iron~Rich around your trees and shrubs to prevent chlorosis, (yellowing of the foliage), promote growth, and increase the overall health of your plant. Set spreader approximately 1/3 open (Example: settings from 0-10, set between #3 and #4, settings A-Z, set at I). For heavier applications set spreader 1/2 open (Example: settings 0-10 set at 5, settings A-Z,set at M). 1 50’x100′ 5,000 sq. ft.
2 100’x100′ 10,000 sq. ft. Ideally apply approximately two weeks before regular fertilization. Apply when grass is dry. Apply Iron~Rich as a part of your Pro-Rich or Richlawn Fertilizer program in July. Iron~Rich may be applied anytime of year from April through October as a supplement to any fertilizer program. Apply Iron~Rich anytime your lawn begins to lose its green color throughout the growing season. Water thoroughly and deeply after application to activate nutrients. Try Gro – Rich Garden Fertilizer for regular feeding of your vegetable and flowering plants. Apply evenly and work into the top 6″ of the soil. Water. If no other fertilizer is used, apply monthly throughout the growing season. the soil and water thoroughly. Spread around the area beneath the outer edge of branches and work inward to within one foot of the trunk. Gently mix with the top layer of soil. Apply April through July monthly to established trees and shrubs. Apply at planting time for new trees and shrubs. Do not apply after September to trees and shrubs. Promotes dark, lush, green turf of your lawn. Non-burning formula. Will turn yellowing lawns green. Iron-Rich contains 10% Iron content as measured by the Colorado State Department of Agriculture. Increases root growth and top growth of grass blades. Appearance of new growth, as grass blades rhizome out and create new grass blades, thickening your turf. Feeds your lawn organically with a 3-2-1 formula, with 10% Iron, and 5% Sulfur. Iron~Rich contains chelated Iron which is the form of Iron most readily available to plants. Increase the fertility of the soil. Make nutrients more available to plants. Improve drainage of heavy clay soils. Increase the moisture retention of the soil. Iron~Rich will slowly release nutrients to your plants. Helps neutralize alkaline soils (soils where the pH is above neutral). Helps decrease the pH of alkaline soils. Remember to sweep and blow Iron-Rich off of concrete after application to avoid staining. Water thoroughly after application to begin activating nutrients. Extra care should be given to avoid ingestion of this product. It will cause sickness and nausea.